As parents, we want the best for our children regarding happiness, security and quality of life. Somewhere the area between empowerment and entitlement has been muddled and convoluted. We have a generation of young people with a false sense that mom, dad, teachers, employers and life owe them. This skewed perception of reality is setting our kids up for a hard life. It’s a level of materialism wrapped with selfishness neatly tied with the ribbon of shallowness. Raising a generation mired in entitlement is heartbreaking and annoying. We can do better than this, but we have to kick into high gear. Entitlement, it essentially means that you have a right to something. This is a belief that without question, you are owed something. Where does this outlook come from? It starts at home and the influence is by peers and society, but parents will lay the groundwork. It starts in your home. There is nothing wrong wanting the best for your young person. Cheer them on and encourage and provide their basic needs. Check. The dilemma is when you choose to provide that cup of soup and continue to ladle out soup and it’s overflowing. Yet, you continue to give more than is needed. It’s actually spilling over the side full. It doesn’t make sense. This ladling epidemic is kicking our kid’s butts and creating a generation of brats. It’s the “I want it now” verbal and non-verbal message that’s ludicrous. Every young person receives messages from their peers and society that stuff, and lots of it, makes you cool. It defines you. It’s our job as parents to fight for our kids and that’s exactly what it is; a battle. We can feel inadequate as parents not providing what our kids want. Throw in an unhappy home life, a divorce or a sick or deceased parent and it often can evoke desires to overcompensate. 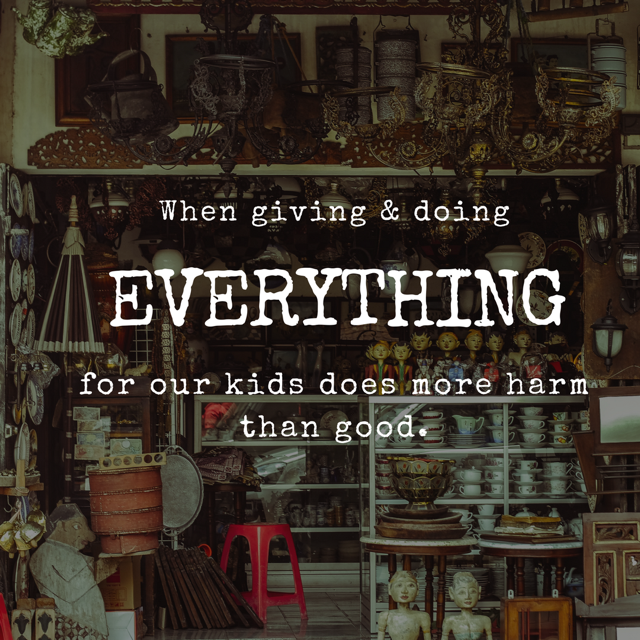 It’s difficult in these situations to not want to make your hurting child feel better with things and places, but (unfortunately) it doesn’t fix anything. Here’s the deal: what we need to do is define for ourselves and our kids the difference betweens needs and wants. Basic needs are much more simplistic than we have allowed ourselves to believe. A few years ago I had the privilege to volunteer in Haiti. These kids live in fourth world conditions where contentment and joy are found in a game of soccer in a dirt field with tattered soccer nets. They travel for fresh water. Many have lost a parent, or both, due to famine, illness or in earthquakes. Yet, there is an ability to find pleasure in the simple things in their lives. Haiti altered my perception of life. We exude excess, yet most of our kids are discontent. We have issues with lack of respect, lack of appreciation and a false sense of reality. Why is this? One word…entitlement. So what now? It’s challenging to not have some elements of entitlement with our kids. Just know, it isn’t too late to change things up. As long as you have a pulse, you can get your goodness on! What you must know that if you want to realign things, it takes time, patience and consistency. Allow me to repeat that, time, patience and consistency. If your young person is caught up with clothes, gadgets and their social world (in an unhealthy way); it hasn’t happened over night. Just as it takes time to become self focused, it takes time to be rewired. Cell phone- Lock down. Your kids do not need cell access 24-7. If they have it, that needs to change. Use your room for housing their phones. They should be handed in by 9 pm and can be returned before they leave for school. Have limits on texting frequency and if they go over your usage, they pay regardless of age. No cell use during meals, family time and while doing homework. They don’t need it. This is one of the best things you can do for them. I promise! Clothes – Most of our kids have more clothes than they need. Thin out their wardrobe. Donate what is not needed. Set parameters for how frequently you take them shopping and how much is spent. Be firm. If they want above and beyond this either they can pay or you say no. Introduce them to thrift shops, looking for sales and getting the most for their money. If parents always pick up the tab there is no concept that $90 for a pair of jeans is absurd. Have them work for a $90 pair of jeans and it’s interesting how that will change quickly. If our kids don’t respect themselves, they certainly are not going to respect their parents. Remind them constantly that you love them and what you appreciate about them. Focus little on the external. Allow them to hear that whether it’s academics, hobbies, or being caring, selfless, ambitious, etc. there are positives and lots of them. Our kids need to be reminded that what defines them is not about what they look like, but an internal factor. They need to love themselves in a non-selfish, adulating kind of way. If you want them to respect others, themselves as well as you it’s time to rock out with some volunteering. I will drive this into the ground until my last breath. Give of yourself; it has a gazillion life lessons. Our kids can be delusional with what they do, don’t have and what they believe is necessity. Get them on the giving train and do it now. We need givers. Selfless, respectful and loving peeps. Volunteering… boom! Get it started! As parents and family members we set the bar accordingly. How is your entitlement barometer doing? Is your need/ want balance in check or does it need some fine tuning? We cannot expect our kids to be rocking out some respectful goodness if we’re on the entitlement train. It just doesn’t work that way. It’s easy to get tangled in things that don’t matter in the long run. Are there times that you feel someone or something owes you just because? Personal challenge is important and it can be contagious with our kids. Awesome! Realize that what comes out of our mouths in conversation, venting or even via text or email are part of the non-entitlement and full fledge entitlement train. Some of our kids are on this big time. 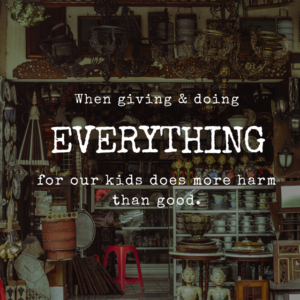 How do we set the example as parents and loved ones? Do we treat others as we want to be treated? Whether that be an issue you have with another parent, teacher, coach, boss, babysitter, etc. How do you handle it? I’d suggest observing how you chat about these peeps in front of your kids. I think chatting about anything negative concerning another adult is fodder for the flames of gossip amongst their own peer group. Not a good one. Our words and actions…do they align? This also pertains to email and text. As a counselor I have received a handful of emails over the years from disgruntled parents who scribe hurtful, unsubstantiated words. Sometimes even sprinkled with some off seasoned language. I find it unfair to disallow us to chat on even ground. As both a parent, wife, mom and counselor I make mistakes. I believe chatting via phone or in person allows us on all levels of life to hopefully clear the air. Refrain from impulsivity, chatting about other peep’s issues in front of your kids. All of these things evoke feelings of entitlement without even realizing it. It’s sending a message that we’re better than these guys. Blah. We are all a work in progress, but when it comes to our kids they are a priority that pulls at our heart strings. I urge you to take an inventory of your own and then with your young person. There’s tremendous potential for growth when we reflect and put our needs and wants into check. It can be painful, but the refining process is life altering. Please check out my e-book, Ten Ways to Empower your Teen and Avoid an Entitled Mindset. If you already subscribe to Goodness Chick’s newsletters you can access this in the Library Resource. If have yet to subscribe get on it (it’s free) and it will be sent your way. This is stacked with information and strategies. It’s awesome!!! Wishing you a week of reflection with a sprinkle of self challenge and overall growth. © 2018 Goodness Chick. | All Rights Reserved.